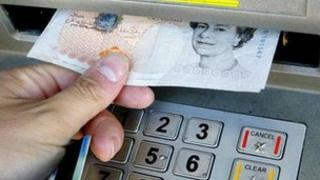 Distraction thefts at shops, bars and cash machines led to a rise in UK card fraud last year, figures suggest. These "crude scams" took total losses to £388m in 2012, a 14% rise on the previous year, figures from Financial Fraud Action showed. Crimes included cards being stolen from consumers by thieves who looked over their shoulder at ATMs to spot their Pin code. About 7p is lost to fraud for every £100 spent on cards, the figures show. Card fraud peaked at £610m in 2008, and had been falling until last year's rise. At its height, card fraud tended to be the result of skimming cards and stealing the electronic data held on them. Chip-and-pin reduced this type of fraud, but now fraudsters have moved to distraction thefts and tricking people into handing over their card details or Pin codes. This is often done by fraudsters calling their victims and pretending to be the card provider. Fake websites were also more successful last year than in 2011, in duping people into handing over personal data. Meanwhile, cheque fraud losses also rose owing to an increase in counterfeit cheques copied from stolen genuine cheques. "Criminals are resorting to low-tech deception crimes designed to dupe customers into parting with their cards, Pins and financial passwords," said Detective Inspector David Timmins, from the Dedicated Cheque and Plastic Crime Unit, a specialist unit funded by the industry. "These fraudsters can be highly persuasive, so our message to customers is simple: your bank or the police will never call, visit or email you to request your login details or Pin, or to collect your card. If you receive such a request, it will always be fraud, so protect yourself and call the police." Unless consumers are negligent or party to the fraud, a bank or card provider should quickly refund any losses from fraud.